Lanterns make a lovely keepsake, house warming gift or to add a special touch to your home. 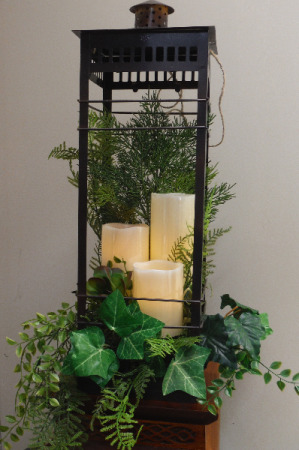 We have metal and wooden lanterns, in this price range they come with 3 LED candles. Candy arranged in a decorative box with matching filler and a bow. A great way to say "Thanks", "Good Luck", "Congratulations" or "Happy Birthday". Balloons may be added, however, the schools prohibit balloons on school buses. Concrete bench,3 pieces. We will add a bow and card for funeral services. Can be used outdoors. Several sayings available. Concrete in the shape of a book with lovely dogwood flowers.